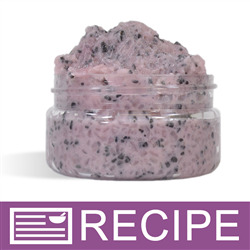 Pamper your feet with this exfoliating salt scrub! 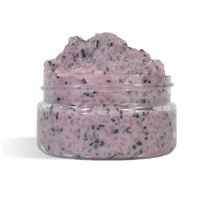 Two different sea salts create the rough texture to this scrub, and they are balanced with rice bran oil and kokum butter. 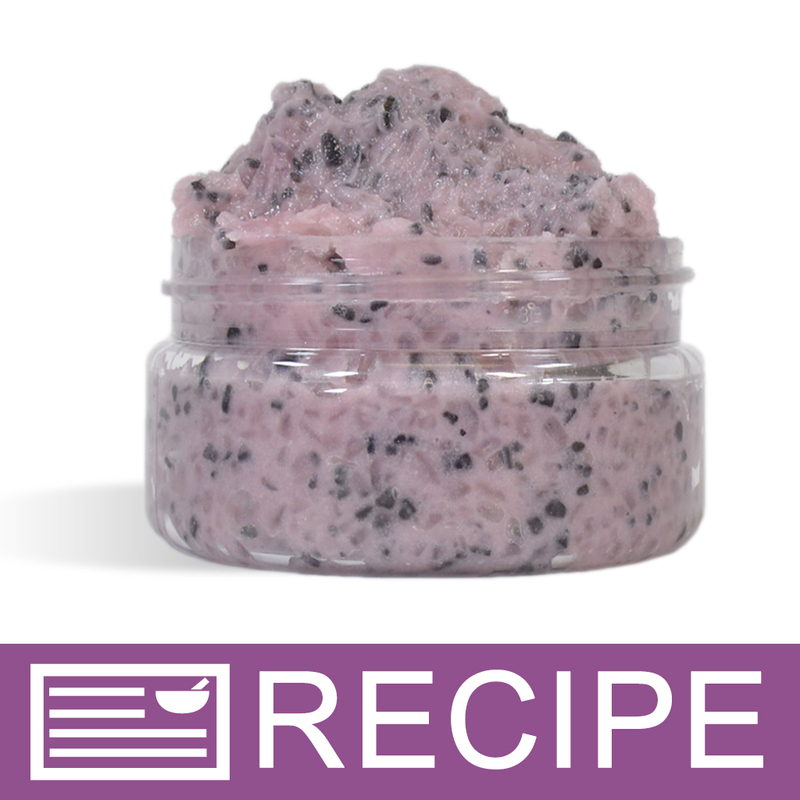 This is a thick emulsified salt scrub that your feet will love! This scrub combined with the Rose Hibiscus Pedicure Soak, Rose Hibiscus Pedicure Cream, and spa socks create a wonderful Mother’s Day set. To metal pot, add rice bran oil, stearic acid, and emulsifying wax. Heat on stove until melted, and then remove from heat. Add kokum butter and stir. When temperature is 122ºF or cooler, add fragrance, preservative, vitamin e, and mica powder. Use a hand mixer to mix ingredients together. To measuring cup, add European spa salt. When oil mixture is 80ºF or cooler, pour onto salts. Mix together with hand mixer until product thickens. Stir black sea salt into batch. Spoon 2 oz. by weight into each jar. Twist on tops. To Use: Rub onto feet. Rinse off with warm water. Ingredient Label: Sea Salt, Rice Bran Oil, Kokum Butter, Stearic Acid, Emulsifying Wax, Fragrance, Vitamin E, Propylene Glycol, Diazolidinyl Urea, Iodopropynyl Butylcarbamate, Activated Charcoal, Mica, Titanium Dioxide, Tin Oxide, Iron Oxide. "Hi I have the same situation as Rhonda. After a few days, oils pooled on top of the mixture and now the oils solid, but the colors turned to yellow green. I followed the recipe exactly, and this is not what I expected. Did anybody else have the same problem or have tried modified recipe with emulsifying wax and stearic acid as suggested? Thank you. E.K." Staff Answer As previously stated, you can try melting additional wax/stearic for more emulsification. If you are still having problems, please contact our Customer Service Dept. for further help. Thank you. "ok so it says now .75 oz. Stearic Acid & .75 oz Emulsifying Wax Soft & Silky, do I add 1 oz on top of the .75 oz making it now 1.75 oz Stearic Acid & 1.75 oz Emulsifying Wax? Just want to make sure I'm adding the correct amount because this scrub is sold to my nail salon client. I really appreciate your help! Thanks"
Staff Answer You want to increase to 1 oz. only so you are adding 1 oz. of e-wax and 1 oz. of stearic. "When the mixture was completely incorporated it was really loose. I put in the freezer for a few minutes to stiffen up and mixed real good with the hand blender. All ingredients were measured so I didn't put too much oils or butters etc. Do you think the humid Florida weather could be playing a factor or do you think I should add or take away one of the ingredients to get the right texture? The recipe states 5 oz of Rice Bran oil could that be too much? Thanks"
Staff Answer The humidity could possibly be the reason but we cannot be sure. The recipe is correct in its measurements. You may need to add extra emulsifying wax to thicken it up - possibly 1 oz. of both wax and stearic but leave the other ingredients the same. Also, be sure the waxes are completely melted. "I made this but noticed after sitting for a few days the oils pooled to the top of the mixture. Is this ok or should I be concerned? I added the emulsifying wax soft & silky which I thought was to prevent this from happening. Thanks so much!" Staff Answer Make sure all your ingredients were weighed out correctly. If the waxes were not completely melted, the product would not emulsify correctly. "May I ask why this is being called a thick emulsified sugar scrub? There is absolutely no sugar added it has only Medium grain European Spa Salt and small black sea salt. Thanks so much "
Staff Answer We do apologize. This was just a typo which has been changed. Thank you for bringing this to our attention.